This week I was at Work Camp for five days. I was filthy most days after working hard alongside my team of awesome teenagers. My wardrobe for the week consisted of work t-shirts and denim shorts, work gloves and safety goggles. There were machetes and pick axes, shovels and lots of dirt. I came down with a massive ear infection that lead to lymphytis which was extremely painful and required more than one visit to the Doc. 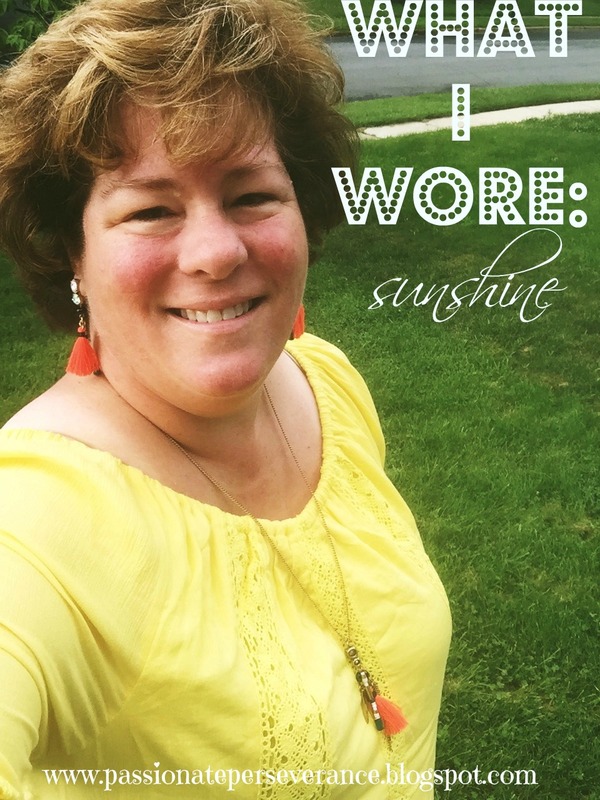 what I wore Sunday…a sunshine yellow shift dress. Finally on day five, I gave in and came home leaving my team up in Ohio to finish things up. Thanks to the awesome adult volunteers (Liz and Patty, I am looking at you!!) my team is in good hands. I have meds and they are working beautifully. I slept for ten hours straight Friday night, then took a four hour nap Saturday afternoon, followed by a pretty awesome sleep last night. I am finally feeling human again. If you’re wondering, I would do it all over again. It was a life changing experience, one I will write about later this week. Shift dress Macy’s house brand Style & Co. Yesterday, was the six month anniversary of Courtney’s Heaven Homecoming. Jerry and I went to Mass and spent the day quietly, enjoying the rain. There were no tears but a general sadness that seems to permeate our lives these days. We are moving forward slowly, but moving just the same. My beloved took me to breakfast using a lovely little gift card that a family member surprised us with. We went to First Watch Cafe and I had the Avocado Toast with eggs and Jerry had the Breakfast Tacos. It was so tasty. I plan on recreating the recipes at home. Yummo! 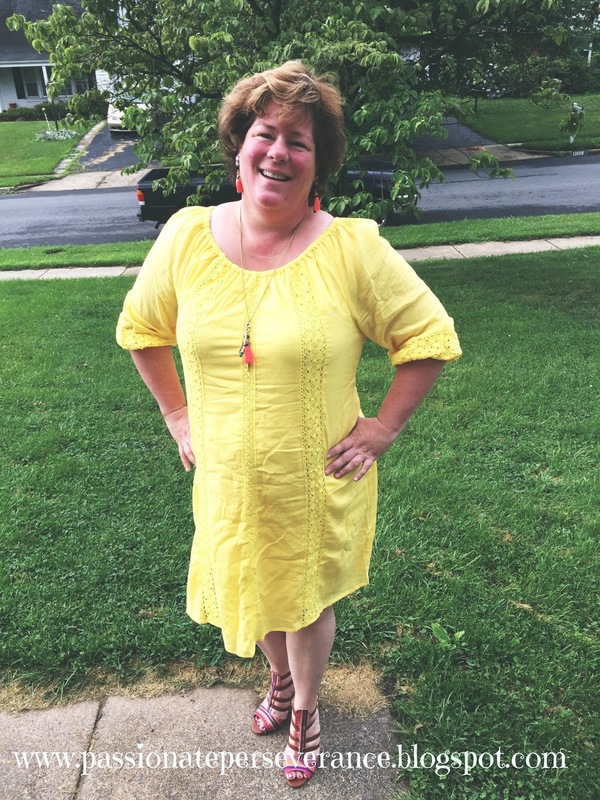 This morning I cranked up the volume with a sunshine yellow shift dress from Lane Bryant. It’s easy to accessorize and quite comfy. If you want to see the fab shoes I wore in greater details, you will have to check out my gram feed. I was looking through some old photos and found these gems from July 2009. 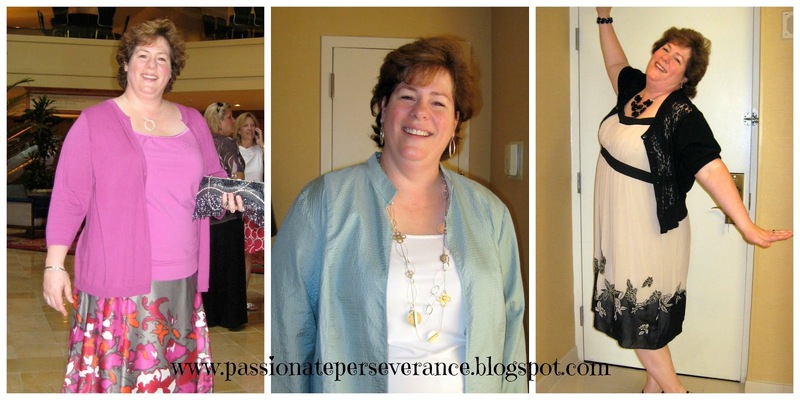 I was a size 24W and attending a writing conference. I wanted to share them because I get a lot of emails and FB messages asking about plus size dressing. So I thought I would share a few of my past triumphs. So there you have it. Me at size 24W and me now at size 18-20W. No matter what the number, it is possible to dress well and really celebrate your own personal style. Our current goal is $1,720.00 which will eliminate a small loan we took to pay for some of Courtney’s therapy equipment that insurance did not cover. We have spent three years paying down. If we can raise this amount, we can pay it off and be that much closer to our larger goal. One thing at a time. Thank you so much for your help. My email has exploded with readers requesting I put the PayPal button back up for those who wish to help with our debt. The entire debt is extensive, approx. $71,000. It’s a lot and will take years to whittle down. Anything helps. Anything. So, I will keep it at the bottom of my posts for awhile. You all have already given so much to our family. Our prayers are with you and we are so very grateful. We can never repay that kindness. So thank you…just thank you. If you would like our mailing address, please just email me at mary_romance@cox.net and I will send it. Go take a photo and join us won’t you? Head on over to FineLinenandPurple and link up. Then you can head over here to Watch What I’m Wearing, celebrating modesty and fashion, Tucker Up, and The Pleated Poppy. It’s a party! You look beautiful no matter what size! Love it! Can't wait to hear more about the trip. thanks so much my friend. you are too kind. That dress looks beautiful on you, Mary! I really love that paisley dress, but you look great in all of them! I've been keeping you in my prayers. The paisley dress is so comfy. Perfect for a hit humid day. 🙂 Thanks so much for the prayers. So pretty! I am glad you are feeling better. Thanks for the tips. I can't wear empire waist because of my bust size, but the other tips help a lot. The yellow dress just makes me smile. I am glad you are feeling better after the ear infection – those are no fun. ear infections are no fun at all! Preach it!! Thanks so much for the prayers and good wishes. You look great, Mary- that is such a pretty dress! And those shoes are some kind of awesome. I love your outfits! I also love tunic tops but they don't look so good on my shape. 🙁 I'm kind of tall, a little chunky in the middle, with smaller shoulders. 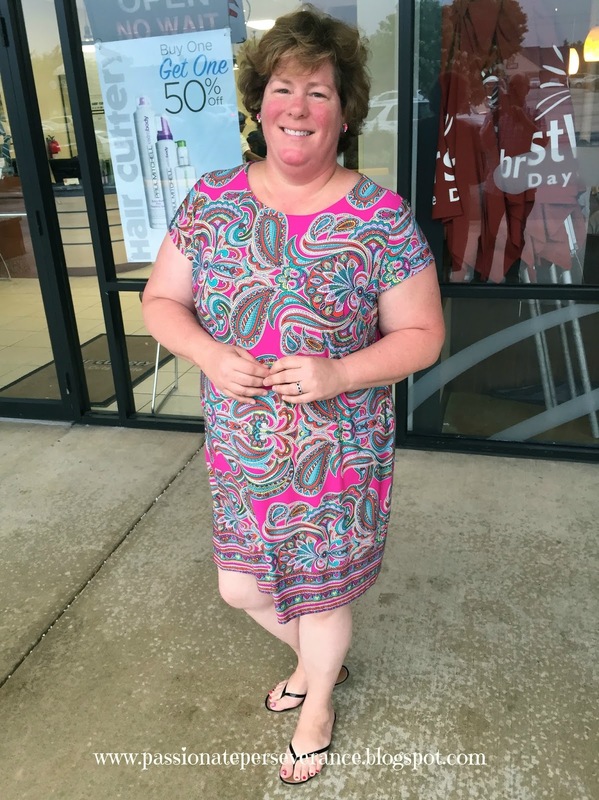 So….a tunic top that looks soooo fabulous on somebody else, I just get lost in! The good part of this is that my sister is a different shape and it is so much fun to shop with her because I get to pick out all sorts of stuff for her to try on that doesn't work on me. It's really fun to work with body styles, as long as I don't frustrated or hard on myself.